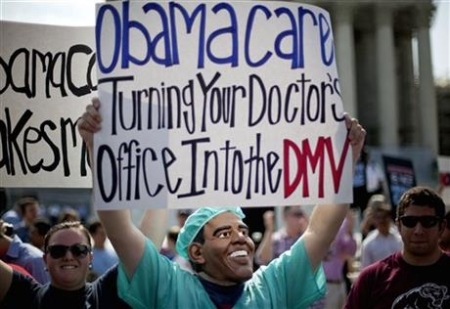 The hit parades on the “Affordable” Care Act just keep coming. Healthcare.gov apparently violates a copyright. One design firm removed all references to its work on the website. Tech experts say the entire website needs an overhaul. Buried in the code we find that you should have no reasonable thought that your information will be kept private. Then there’s this. (Fox News) Insurers say faulty data from ObamaCare marketplaces is straining their ability to handle even the first wave of consumers who were able to sign up for health insurance using federally run exchanges during the glitch-ridden rollout of the new law. Executives at more than a dozen health insurance companies say they have received data from online marketplaces that is riddled with errors, including duplicate enrollments, missing data fields and spouses reported as children, The Wall Street Journal reported Thursday. It’s not like they had 3 years to get the website ready to go or something. Perhaps if they had tested it more than a week out? Na. Would most likely still have been a disaster. So far, only one percent of Exchange visitors actually signed up for insurance. USA Today reported on the first Delaware signup….on October 16th. The marketplace opened on October 1st, if you remember. Let’s not forget that right now we are getting the stories of the website failures. We had been getting stories of companies dropping their insurance, cutting people to part time, and insurers dropping individuals and companies because of ACA mandates. We’ll start seeing more of those as time goes on, and probably ones about companies heavily dropping coverage as 2015 and the employer mandate approaches. What wel’ll start seeing soon are stories about how difficult it is to use the ACA insurance, being denied care, having to pay thousands out of pocket for service. Doctors not taking it. Doctors refusing to take on more Medicaid and Medicare patients. Substandard treatment. Actually using the insurance will be the nail that highlights how bad this program is.